Michigan based iFolloSports.com correspondent Lance Martinez also captured this original photo of Red Wings defenseman Danny DeKeyser signing autographs. 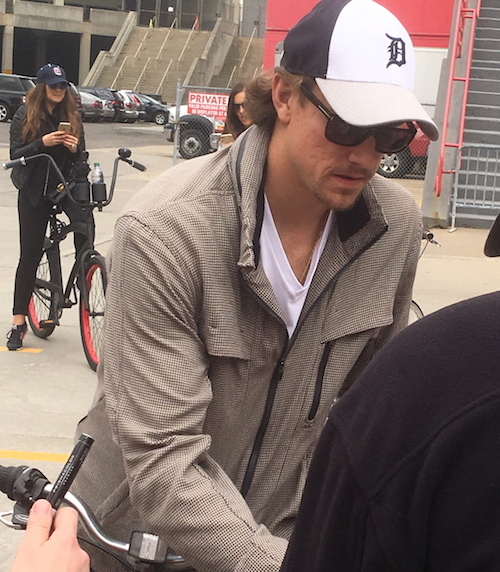 DeKeyser, a Detroit area native, was on his bicycle sporting a Detroit Tigers hat, when spotted outside of Joe Louis Arena, in the days after the Red Wings were eliminated from the playoffs by the Lightning. DeKeyser, who just finished his third full NHL season, has been a very solid defensive player for the Wings. To this point in his career, the 26-year-old has scored 14 goals and totaled 61 assists. A proud Michigander, DeKeyser attended De La Salle High School, in the Detroit suburb of Warren, before spending three years at Western Michigan University. Red Wings fans can also view several other original stories, chronicling the team over the past few years.